The summer solstice saw Cosmic Dancer unwittingly at the centre of a rather unusual celebration. 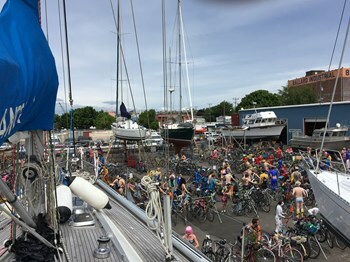 We woke on Saturday morning to find our yacht surrounded by several hundred naked cyclists busily body painting themselves before setting out on the Fremont Solstice Parade Cycle Ride, an event described by the organisers as an "...outpouring of artistic fossil-fuel-free fun as the painted cyclists entertain the crowd with their boldness, bareness and enthusiasm!" To be fair we had been pre-warned by the boatyard, who clearly thought our sensibilities were in need of protection, that their contribution to this annual bacchanalian celebration was to provide the al fresco studio for all the body painting to take place. We've fitted out Cosmic Dancer in some unusual places in recent years, but to be surrounded by so many naked bodies as we busied ourselves in re-rigging the yacht was definitely a first! Naked festivals aside, the only other significant thing to characterise our fitting out this year has been the sheer amount of work involved in switching the yacht from "overland travel mode" back to "seagoing mode". Jeanne, Brad and Cross Country Transportation did a fantastic job of getting Cosmic Dancer 2/3 of the way across America without any damage, and the team here in the CSR Marine boatyard have been equally helpful in doing the jobs we can't do ourselves, but nonetheless there has been plenty to keep us busy, with scarcely any time for sightseeing in Seattle. However, purely by accident we seem to have found ourselves in what must be the microbrewery capital of America. Within 5 minutes staggering distance of the boat there are at least half a dozen different breweries, each with its own on premises bar. The only thing that has saved us from some serious hangovers has been the fact that alcohol is so insanely expensive in the bars of Seattle that drinking in Scandinavia, a place we have always regarded as setting the bar for exorbitantly priced drinks, seems positively cheap by comparison! The fitting out is almost done and we hope to be back in the water and on our way before too much longer - as we were so colourfully reminded on Saturday, summer is already upon us and we're itching to get some sea miles under our belts.